Back in April the inaugural article on this blog was about heartbeats and life expectancy and it has been one of the most popular posts ever since. The concept that we may have a finite odometer attached to our heart is a fascinating one, and it’s one of the best motivations to get out there and run. 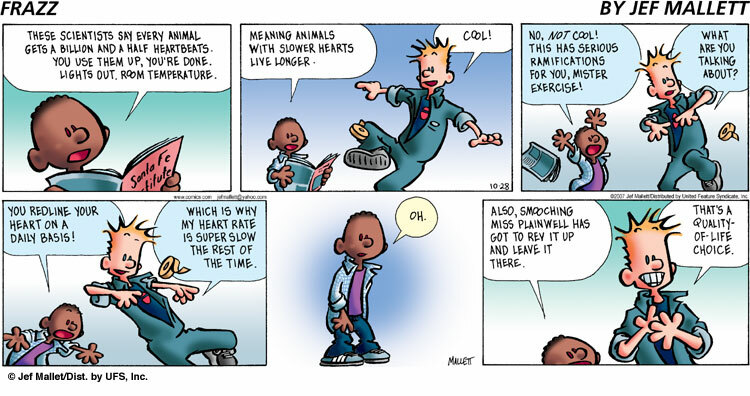 Jef Mallet, the creator of the comic strip Frazz, understands this motivation. Mallet is a devoted endurance athlete and that aspect of himself is projected onto Frazz, the main character in his comics. In the October 28th Sunday edition, Frazz explains why burning up your heartbeats in training can lead to a longer life expectancy. Does this mean that Mallet was one of the readers of my blog? While I’d love to be a source of anyone’s inspiration, evidence in the Sunday comic indicates that Mallet probably got the idea from an article about the theory of aging by the Santa Fe Institute. Ryan: Did you go running today? me: Yeah, but I only did an easy three miles. Ryan: “Easy” and “three miles” make no sense together! me: But I was running slowly! Ryan: “Running” is shooting a layup. Anything measured in miles is too far. 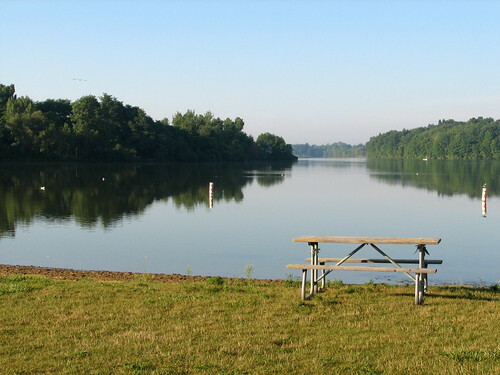 Deep in the heart of central Michigan farm country is Sleepy Hollow State Park, a splendid network of trails surrounding Lake Ovid. A hundred or so scantily-clad folks congregated here this morning, drawn here by The Legend. The legend of Ichabod Crane? The headless horseman? 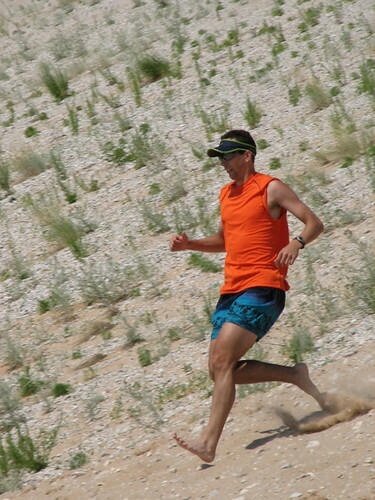 How about a trail run? Why yes, these people were runners, searching not for a lost head (although some would argue otherwise!) but rather a win, a personal best, or just an enjoyable run through the woods. I joined the crowd at the start line despite waking up late (6:00 am) for the one-hour drive, showing up with 15 minutes to spare. The Legend is actually two races: a 5-mile trail run and a 10-miler that begins ten minutes later. This race is hosted by Running Fit, the same company that organized the Road Ends trail run that I ran earlier this spring. I was tempted to run the 10 mile edition since it scenically circumnavigates Lake Ovid but with the Fallsburg Marathon coming up next weekend I didn’t want to overdo it. My goal today was simply a 40-minute 5-miler, just as I’d done at Road Ends. Things started off pretty well as my first mile passed by in a surprisingly fast (for me) 7:14 and although I was feeling good, I knew that this was a bit too quick. Sure enough, mile 2 arrived at a perfect 8:00 pace and I concentrated on maintaining my rhythm on the winding dirt trails. Compared to the hilly and rocky trails of Road Ends, the trails here at The Legend were much flatter (with one big hill) and features countless sharp turns and exposed tree roots. In fact I did stumble twice but managed to stay upright. My face also took a couple blows from overhanging tree branches and I had to duck dozens of others – I noticed that my shorter competitors did not require such maneuvering! My lower back is a bit sore now, presumably from all of the bending to duck the attacking leaves. But that is what makes trail running so much fun! Mile 3 went by at a 8:07 pace but I was feeling very fatigued at this point. I never figured out why – perhaps the poor night’s sleep, or running five miles yesterday, or starting out too fast, or maybe the heat of a warm, humid morning? All of the above? Well it doesn’t matter during the race – no excuses – and by this time I was getting passed quite regularly, about a dozen times in all. I knew I’d slowed down a bit, but was appalled to see mile 4 arrive at a 8:50 pace! What a downer. I was going to need a sub-8:00 final mile to break 40 minutes and I was still feeling like crap. It’s frustrating… I tried to speed up and I just couldn’t. Coming down the home stretch I did my best to turn on a finishing kick but that last mile proved to be too slow and I crossed the line at 40:20. 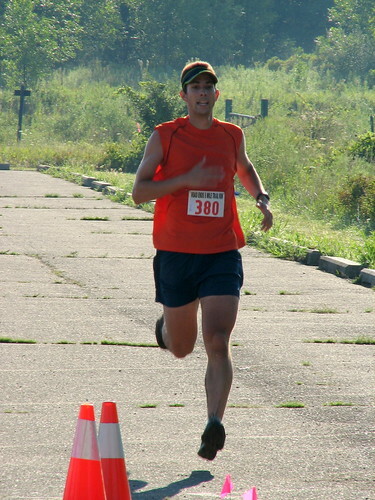 Results aren’t online yet but they were posted at the race – I finished 25th overall, 21st male, and 4th in my age group. I think there were about 50 runners in the 5 mile. The overall winner was Ian Forsyth, a former Michigan Runner of the Year who dominates most races he enters, and he finished in 27+ minutes! A 5:31 pace! I don’t think I can even run one mile at that speed! On 7/7/07 I was one of the few people not getting married that day… Instead I was lucky enough to be invited to the cottage of a family friend, a cottage that is literally adjacent to the Sleeping Bear Dunes National Lakeshore! Growing up in Michigan I’ve been to Sleeping Bear several times over the years yet I could never get used to such amazing landscapes. 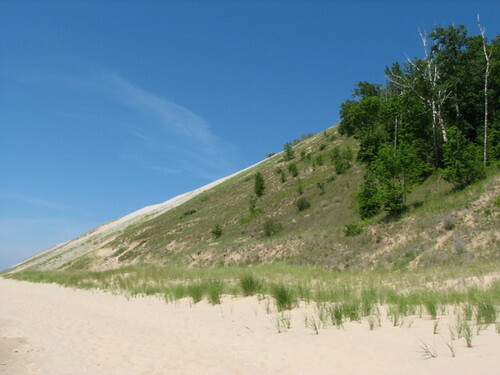 In my opinion Sleeping Bear Dunes is one of the most spectacular parks in the entire country! Amanda and I drove the three hours north with my cousin and navigator Ana, who’s been going to this cottage all her life. Sadly my brothers couldn’t make it, but my parents were there along with some aunts, uncles, and cousins. First off I sampled several pieces of raisin spice cake along with countless other snacks that everyone had brought along. Yum! Then there was some beach frisbee, then floating in Lake Michigan on inner tubes, then hiking down the beach to a small lake, then more floating over the sandbar, then some beach hillbilly golf. Yep, we spent a lot of time on that beach! Amanda has the sunburns to prove it, too. 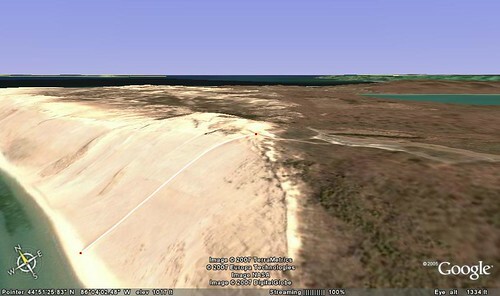 Being so close to Sleeping Bear, all day I was eying this giant sand bluff with plans to climb it. Legend has it that some years ago my cousin Gabe set the family ascent record at 7.5 minutes while Ana holds the female title at 10 minutes. Both were teenage-fast avid cyclists, but could I keep up? Wow, this wasn’t going to be easy! The ants crawling up the hill formed in to humans as we got close enough to see the action, and crawl was the word of the day – I noticed that everybody who was going up was doing so on all fours! Off we go! I was able to walk upright for the first two minutes before so much lactic acid built up in my quads that the muscles refused to respond to my commands. I was forced to rest a few seconds before I resumed the ascent, this time using all four limbs like everyone else. The terrain was atrocious! The sand was filled with rocks from pebbles up to softball size and my toes took a beating. Each step I took, my foot slid halfway back down the hill! Progress was frustrating to say the least. While my feet mashed through the sand and rocks my fingers were like pitchforks jabbing into the hillside until they became so tired that I had to walk on my knuckles just like a chimpanzee. After 14 minutes I finally made it to the top! In retrospect I probably could’ve made it in 12 had I not burned out my quads by walking upright in the beginning. I can see why my cyclist cousins were so fast – you really need strong thighs! My lungs were fine but my quad muscles were operating above their lactate threshold the entire climb. Ana arrived to the summit in 15:45, then her sister Adrienne in 16:30. The three of us sat down (“collapsed” might be a better word!) to recover and take in the incredible view of Lake Michigan stretching to the horizon in front of us. Finally we had company – Uncle Andy arrived at 25 minutes followed by his young daughter and her friend who impressed everyone with a 26-minute climb. My dad made it to the top in 31 minutes – not bad for a guy pushing 60 years old! He rides his bike a lot and that really helped him – he said that his lungs were the limiting factor, not his legs. Andy’s young son arrived at 35 minutes, toting his snowboard all the way! Last but not least, Aunts Therese and Kathy dragged themselves up in 36 minutes. Everyone made it! After maintaining an effort that was close to what my 5K pace feels like for 14 minutes just to reach the top, I ran down that same hill in just one minute! What a blast that was. It really did feel kinda like downhill skiing, but unless you’re as fit as sky-runner Matt Carpenter you only get one hard-earned “lift ticket” to the top! My feet were very sore during the walk back to the cottage, but being able to splash them through the cool surf of Lake Michigan helped soothe the pain. Best of all, back at the cottage it was time to eat! Now that was a meal well earned. 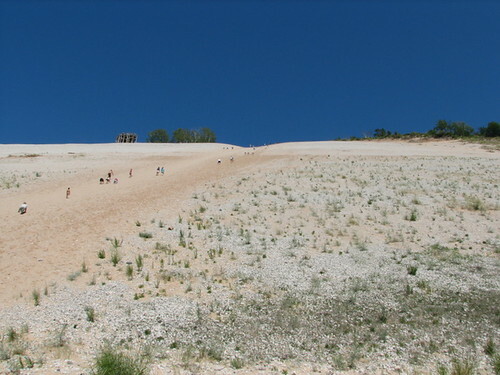 I can’t wait to go back someday and conquer the Sleeping Bear bluff again!